Dolls, if there’s one thing everyone knows about me, it is that I love to sparkle. I am incapable of passing up a mini bedecked in sequins; glittery ballerina flats make me giddy; and sweaters sporting subtle shimmer place me on the brink of a splurge. 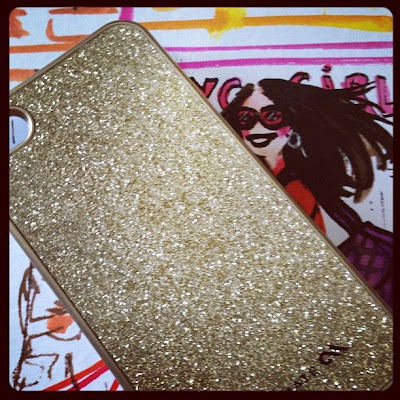 Thus, when I was offered the chance to select the Case-Mate case of my choice to clothe my iPhone 4S, I went straight for the goods…the Glam Case in Gold. I counted down the seconds for the arrival of this case; and, upon opening the package, quickly saw that it was well worth the less-than-one-week-wait (which felt like an eternity). Unlike many glitter cases that I have encountered, which feel grainy to the touch; the Glam Case is dripping in a dazzling glitter-coated inlay which is ultra-smooth when handled courtesy of a clear, hard plastic shell which protects the glitter embellishment, keeping it in place, and providing a shiny, lacquered finish – a quality that ensures a sleek, streamlined look which spells perfection for decadent Girls’ Night’s Out, and will make for the perfect holiday attire for your iPhone 4S counterpart come New Year’s Eve. As bubbly and effervescent as fresh-popped champagne. The Glam Case will be the envy of your girlfriends; and your go-to accessory for sizzling nights on the town – don’t leave home without it! Very cool colors. I'm afraid mine is in a crocheted sleeve. This definitely has the party look to it. How adorable! So need one for my iPhone 4s! i loooooooooooooooove this!!! i need a new iphone case!! if i had an iphone, i'd definitely get one of these. This is so you (and me!) I would get an iPhone just for the awesome case. Definitely a perfect accessory for going out. Love! My iphone is currently rocking pink bling but I am LOVING the gold!! I love CaseMate. I have a few of their covers, and they always look amazing. I love how these pop! So cute. Ha. I need an iPhone first...but I love these. Just the perfect amount of sparkle! 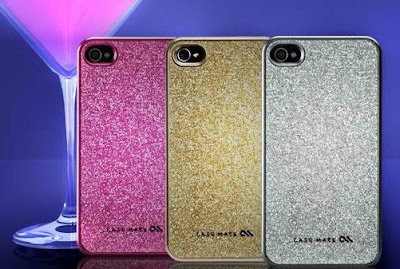 My iPhone is in desperate need of a new case and an adorable sparkly case that doesn't leave a trail of glitter sounds perfect! Love the gold one. I totally got a plaid case for my iPhone, but I really want a pink sparkly Case Mate case now. right now, my iphone has a bright yellow cover, i love it! How cute is this! Mine is the leopard J crew one, but you are tempting me.